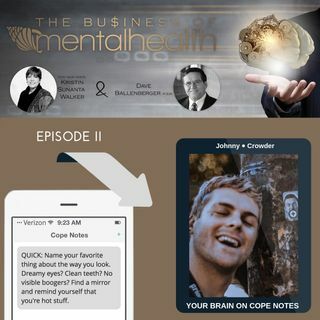 Johnny Crowder joins hosts Dave Ballenberger and Kristin Walker, to talk about his SMS platform CopeNotes.com which is shaking how we look at effective treatments in mental health. Johnny is a musician, singer, artist, and tech entrepreneur who has fronted several heavy metal bands. He founded CopeNotes as a tool to help those struggling with their mental health. A daily reminder that helps you strengthen and renew neural pathways.